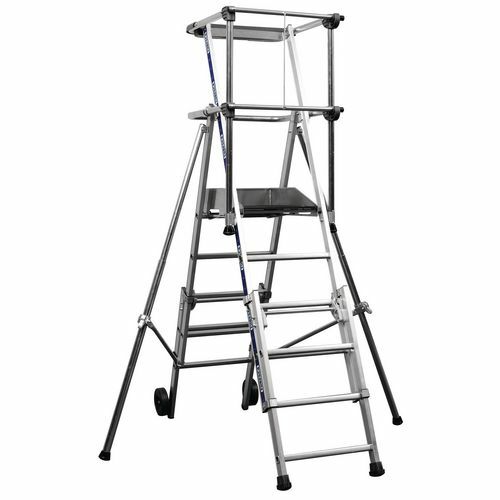 High quality hight adjustable aluminium safety steps. Safety guard rails on 3 sides and gated closure. Folding stabilisers - adjustable for uneven ground. 600 x 400mm solid work platform, with toe boards. Easy to manoeuvre, fitted with 200mm dia. wheels. Folds for ease of transportation and handling. NF PIRL 93353 (3-4 tread) and NF PIRL 93353 (4-6 tread and above) compliant. Working at above head-height demands the most robust and secure working platforms available, and that's what you get with our telescopic work platforms. These single-person platforms are easy to manoeuvre, and come with sets of adjustable stabilisers so that they can be used on uneven surfaces. They are available with three maximum working heights, from 3m (117 inches) to 4.1 metres (160 inches). They even come with a built-in tool tray so that you or your workers don't need to regularly climb or descend the steps to get access to the equipment you need. The 200mm (eight-inch) wheels attached to each platform make them easy to move when folded, while a maximum load of 150kg ensures enough capacity for your workers and most of their tools, equipment or accessories. Our telescopic work platforms are a useful addition to a workforce, helping them to safely and efficiently work at height. They come with a 60 month guarantee and FREE UK Delivery.